EACH TIME you see your health-care provider, you probably assume that the advice given during the session is headed in a single direction – from the medical expert to you. After all, you are there to learn how to take better care of yourself. But, believe it or not, your health-care provider is learning from you as well. Have you ever left your health-care provider’s office more confused than enlightened? Medical folks frequently throw around scientific terms that are unfamiliar to many individuals. Communication only works when both parties understand each other. Hopefully, more health-care professionals now understand this valuable lesson. It is fascinating to read about all of the developments happening in the world of diabetes, but for those who have it, their main focus is on their own health. Your health-care professional must appreciate that you and your specific needs come first, rather than just citing the latest study that has been conducted on diabetes. When I first began counseling people with diabetes more than 25 years ago, I taught patients to adhere to the guidelines set out by a particular diabetes organization. Over the years, my patients have taught me that there are a variety of ways to care for diabetes. In those days, people with diabetes relied heavily on their health-care providers as their main source of medical information. Nowadays, individuals often enter the doctor’s office with an extensive amount of knowledge. This heightened awareness enables patients and health care practitioners to develop a true partnership. The doctor is no longer a benevolent “parent” who tells the “child” exactly what to do. 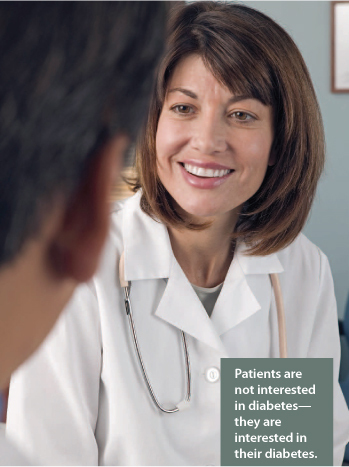 Now, the doctor and patient can be a team that explores treatment options together. Yes, as health-care providers, we do learn a great deal from you.